If the rumors and leaks about Apple's (AAPL) iPhone 8 are to be believed, then it should look pretty similar to Samsung's (SSNLF) newest flagship phone, the S8, that was released last week. But an expert says it's easy to tell the difference between the two tech giants' phones once you tear them down. iCracked CEO A.J. 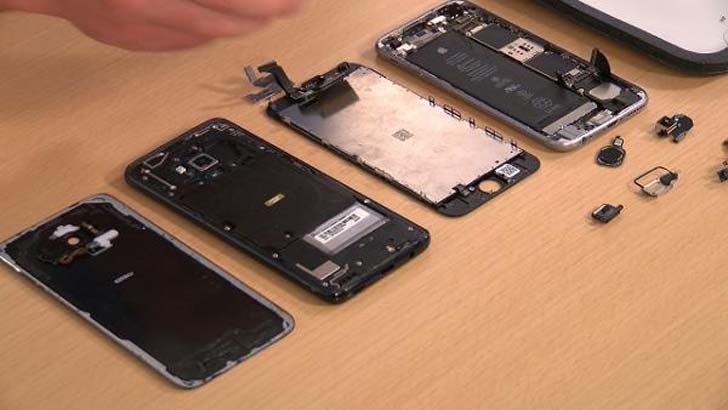 Forsythe joined TheStreet this week to demonstrate how to take apart and put back together the Galaxy S8 as well as an iPhone 6s. His company allows people to order a technician to their home, office or a coffee shop to fix their phones in about 30 minutes. [post_ads]Although the specs on Apple and Samsung phones are nearly identical, the insides are unique to each company, Forsythe said. "If you've taken apart a couple of devices, you can 100% tell which company designed which," he said. "Apple is more design-focused and Samsung is more focused on hardware and utility." Former Apple CEO Steve Jobs was well known for his pickiness when it came to design, wanting the inside of Apple's devices to look as streamlined as the outside. "I think Apple's design ethos inside the devices is more pleasing to work with, but replacing the screens are very similar," Forsythe explained. In addition, Jobs didn't want anyone being able to tinker with the insides of Apple's devices so the iPhone 4 came out with pentalobe security screws that were meant to keep people from taking them apart and modifying them. "At first everyone was like, 'Oh my gosh this is crazy,' but now you can buy a screwdriver that can get past them for about 50 cents," Forsythe said. The most notable similarity that's expected between the Galaxy S8 and the yet-to-be-released iPhone 8 is the stunning edge-to-edge OLED screens. In fact, Apple actually ordered 70 million OLED screens from Samsung this year, so expect a very similar look to the S8. OLED screens provide better picture quality and are more power efficient. While these larger glass screens are gorgeous, they come at a cost. Forsythe says his company tracks breakage rates and has noted that the larger devices tend to break more frequently. Even when taking apart the Galaxy S8 with special tools, he has to be extra careful to not crack or shatter the glass panels. This is in line with a study from protection plan company Square Trade that found the S8 was more prone to cracking than its predecessor, the S7. "While the nearly all-glass design of the S8 makes it a beautiful phone, it's extremely susceptible to cracking when dropped from any angle," said Jason Siciliano, vice president global creative director at SquareTrade. Of course, the S8 is Samsung's first flagship phone release since the Note 7 disaster that started with a few phones overheating and led to the company's biggest recall ever, costing it a total of $5 billion despite the fact that just 330 of the three million Note 7 devices were affected. "On a global scale, it was a fraction of a percent of phones that had issues, but everyone seems to be blown up about it," Forsythe said in good humor. For comparison's sake, the S8 battery is also notably shorter and thicker than the longer and thinner battery seen in the iPhone S6. While Samsung obviously doesn't want a repeat of the failed launch, Forsythe said there wasn't much of a difference in the battery placement of the batteries in the S8. The one difference is that the batteries in the S8 are held in a little more snuggly than usual. However, Samsung has also added an eight-step battery safety check system to its manufacturing process. While customers seem happy with the batteries in the S8 so far, there have been complaints logged about a reddish hue on the displays of the new phones, as well as spotty Wi-Fi connections. Samsung said that it would roll out two separate software updates to the phones to fix both problems. "I would not be happy if I bought a $700 phone and couldn't connect it to Wi-Fi," Forsythe noted. One feature that Samsung appears to have cut from the S8 is an Optical Image Stabilization system for the front camera meant to keep it from shaking when the user is taking selfies. A breakdown of the phone from YouTuber JerryRigEverything shows would appears to be the start of the IOS system that the company may not have had time to finish. "That is something that could happen," Forsythe said. "I mean you have to make your annual shipping deadlines." In fact, iCracked has recently been taking apart Alphabet's (GOOGL) Google Home devices and found wiring that suggests the company started making a wireless charging base on it before canning the feature. While the S8 and iPhone 8 are expected to have similar specs, including large OLED glass panels, facial recognition, finger scanners and iris scanners, the prices may differ. The Galaxy S8 starts at $720, whereas a number of people think the new iPhone could hit the $1,000 price tag. "I think at least one version of the new iPhone will be above $1,000," Forsythe commented. The most common repairs that the iCracked team is asked for are cracked screens, batteries that die too soon, home buttons that aren't sticking, volume buttons that aren't working, ear speaker replacements and water damage. While Consumer Reports says that the S8 is more scratch-resistant than the S7, Forsythe notes that if a screen does crack, the only way to fix it is by replacing the screen. Apple coats its phones with different polymers to protect it from scratches, but they wear off with regular usage in about three months, he said.